Carolee Schneemann, Snows. Still from the documentation (1967). Courtesy of Electronic Arts Intermix. 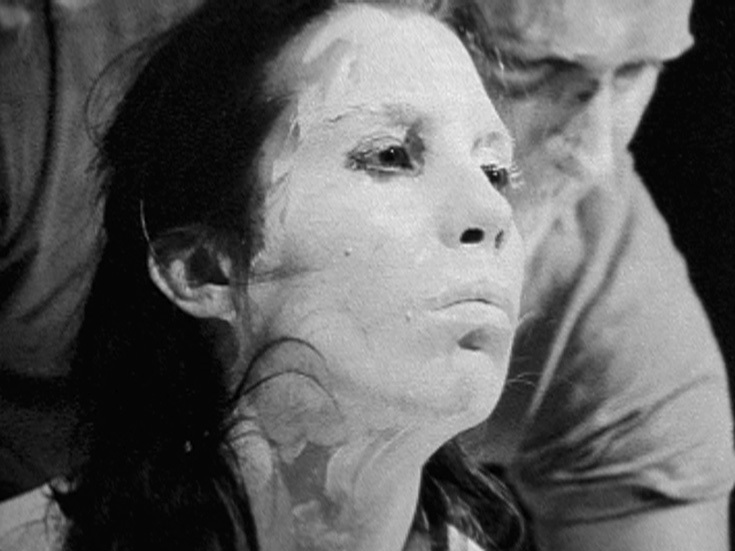 Carolee Schneemann (1939-2019) was a groundbreaking American multidisciplinary artist, with a work encompassing performance, film, video and painting. She is known for her performance based works on the body, gender and sexual expression and liberation. The focus in her works on the perception of the female body brought her to be considered one of the first-generation feminist artists. Her happenings and "kinetic theater" involved the artist's naked body, and group performances. Snows, a newly restored version of documentation of the 1967 group performance Snows, which was built out of Schneemann's outrage and sorrows over the atrocities of the Vietnam War. An ethereal stage environment combining colored light panels, film projection, torn collage, hanging sacks of colored water, "snow," crusted branches, rope, foil and foam was the set and setting in which an audience-activated electronic switching system controlled elements of the performance/installation. Images from film, slide and live action propel silent, ghostly performers to become aggressor and victim, torturer and tortured, lover and beloved, as well as simply themselves in this breakthrough mixed-media film performance. (The film Viet-Flakes is a central element). In 2007 EAI received a grant to preserve this work through the Avant-Garde Masters program funded by The Film Foundation and administered by the NFPF. | Camera: Alphonse Shilling. | This film was preserved through the Avant-Garde Masters program funded by The Film Foundation and administered by the NFPF. | Courtesy of the Electronic Arts Intermix, New York. Courtesy of Electronic Arts Intermix and Fondazione Bonotto.